You took your snowmobile out for a good time - the last thing you need is to slip and fall walking around off your sled and get yourself hurt! Nobody wants to tell that lame story to their buddies on Monday morning! “You hurt yourself snowmobiling?” “Uh, yeah… something like that.” Be smart. 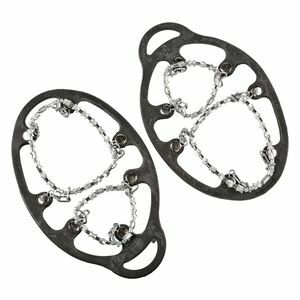 Get a set of ICEtrekkers Diamond Grip crampons and navigate winter weather conditions on foot with confidence. Leave any risk of injury for the fun part - riding the sled!